The B2320, B2620, B2920 and B3200 tractors feature hydrostatic transmissions with three-range speeds, offering operators improved power and control. 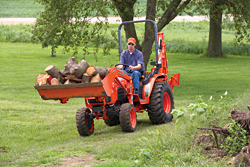 The B3200 features a four-cylinder, 23-horsepower (hp) diesel engine, power steering, and mid-power takeoff. The B2320, B2620 and B2920 feature three-cylinder, liquid-cooled diesel engines. All have a range of safety features, including: multi-reflective headlights for improved vision; a backlit dash panel; and a slanted hood that offers a clearer view of front-loader operations.